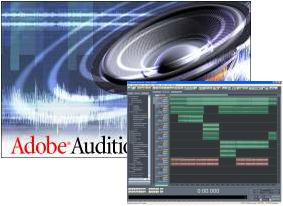 All our audio FX are edited using one of the best software in the business "adobe audition"
integration with Adobe video applications. to be played. We can set the required level (volume), pan, length and speakerselection for each cue. The USB GO BOX is a 6 button Midi remote intended for the control of sound playback software SCS. The USB GO BOX outputs MIDI data from 2 independent USB sockets allowing 2 machines to be controlled simultaneously (main and backup).